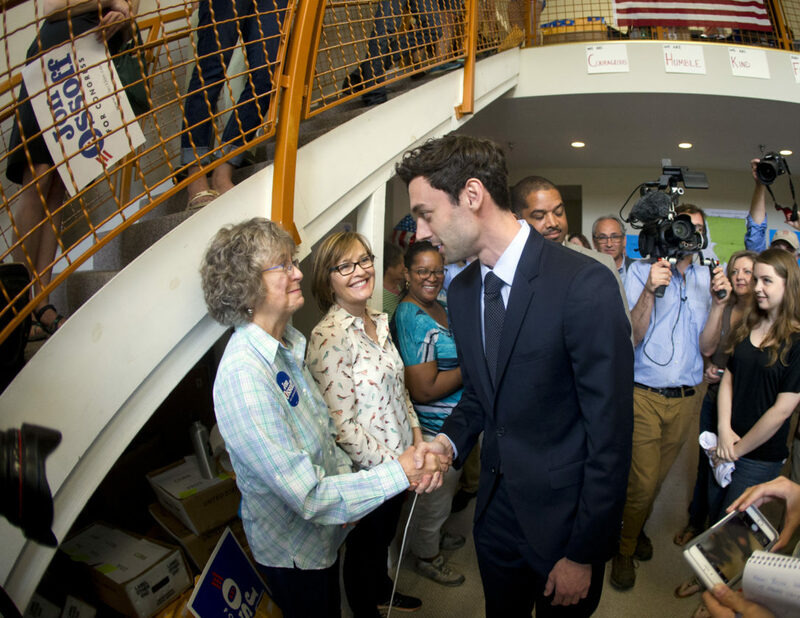 AP PHOTO Democratic candidate for Georgia's Sixth Congressional seat Jon Ossoff greets supporters at a campaign field office Tuesday, in Marietta. DUNWOODY, Ga. — A narrow miss by a Democratic newcomer in a conservative Georgia House district has triggered a high-stakes runoff that could test President Donald Trump’s influence and the limits of the backlash against him. Democrat Jon Ossoff, a 30-year-old former congressional aide fueled by a colossal fundraising haul from out-of-state donors, came within two percentage points of an outright victory Tuesday over 17 other candidates in Georgia’s traditionally Republican 6th Congressional District. Republican Karen Handel, a former Georgia secretary of state, lagged in a distant second, qualifying her for the runoff. Well known to voters, Handel had treated Trump gingerly in a district the president barely carried, but declared Wednesday she’d like to see him campaign for her ahead of the June 20 runoff. Trump, who attacked Ossoff in recent days as a liberal shill and mocked him for living outside of the district, crowed on Twitter about the outcome in Georgia following Democrats’ failure to win a different special election in Kansas last week. “Dems failed in Kansas and are now failing in Georgia. Great job Karen Handel! It is now Hollywood vs. Georgia on June 20th,” Trump wrote, alluding to celebrity donors to Ossoff. Still, the close finishes in Georgia as well as conservative Kansas underscored Democrats’ potential to capitalize on surging liberal energy following Trump’s election, even as they also pointed to the limits of how far Democrats can go in Republican-friendly districts. Both major parties are approaching the runoff in Georgia as an important test ahead of the 2018 midterm elections. Democrats have a long-shot chance of taking back control of the House next year and breaking the GOP’s monopoly control of Washington. But it will require picking up more than 20 seats and winning over droves of voters like those in the affluent, well-educated 6th District of Georgia.